LAGOS (Reuters) - Nigerian authorities have seen documents suggesting the proceeds from past crude oil sales were diverted to personal accounts rather than reaching government coffers, President Muhammadu Buhari said in a wide-ranging interview on Wednesday. Africa's biggest economy faces its worst economic crisis in years, since it relies on oil exports for about 58 percent of government revenue. The sharp fall in oil prices over the past year has hit those revenues hard. This problem has been exacerbated by the long-standing mismanagement of oil revenue. Buhari has previously said treasury coffers were virtually empty when he took office in May and that "mind-boggling" sums of money had been stolen. The 73-year-old former military ruler, who won April elections after campaigning on an anti-corruption ticket, outlined progress made by his government in a two-hour "media chat" with three journalists broadcast live on state television. "We have some documents where Nigerian crude oil was lifted illegally and the proceeds were put into some personal accounts instead of the federal government accounts," said Buhari. The president said stolen money had already been recovered by the government. He did not disclose the sums involved and said he could not provide more details because various cases were being taken to court. A former oil minister, Diezani Alison-Madueke, is under investigation as part of a crackdown on corruption in the oil industry. She has denied any wrongdoing. Buhari's latest comments suggested other officials might also be named. A 2013 investigation by former central bank governor Lamido Sanusi raised questions about the alleged disappearance of about $20 billion in oil revenues. Clad in a white kaftan, the president answered questions on a wide range of topics, from security to the economy, unemployment and the Biafra secessionist movement. Smiling frequently and at times laughing, Buhari seemed more at ease in the public interview format than his predecessor, Goodluck Jonathan, who widely considered to have responded to with rambling answers. Buhari said the government was prepared to hold talks with the Islamist militant group Boko Haram in a bid to secure the release of around 200 schoolgirls kidnapped from the northeastern town of Chibok last year. 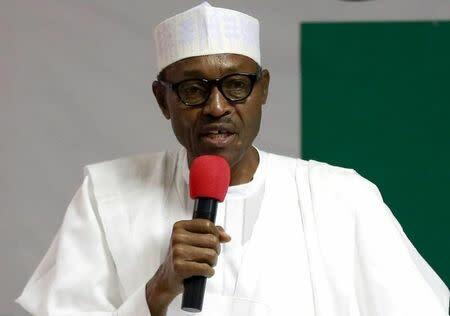 "If a credible leadership of Boko Haram can be established and they tell us where those girls are, we are prepared to negotiate with them without any preconditions," said Buhari. However, he said there was no firm intelligence on the whereabouts of the girls, whose abduction in April 2014 prompted an international outcry, or whether they are still alive. Boko Haram has been waging a six-year campaign to create an Islamic state in northern Nigeria. More than 1,000 people have been killed in attacks by suspected Boko Haram militants since Buhari took office. In the latest flare-up, two suicide attacks killed at least 48 people on Monday. The president also reiterated his belief that Nigeria's currency should not be devalued further, despite the central bank's growing struggles to keep the naira at current levels. And he backed measures imposed by the central bank to restrict access to foreign exchange, which have not gone down well with investors. "The foreign currency restrictions cannot be lifted because the money is not there," the president said. Buhari added that "productive industries" - such as manufacturers - should be identified and allocated foreign exchange to pay for "essential materials" rather than to "those who want to import rice and toothpicks".